Radiation is energy given off by matter in the form of rays or high-speed particles. All matter is composed of atoms. Atoms are made up of various parts; the nucleus contains minute particles called protons and neutrons, and the atom’s outer shell contains other particles called electrons. The nucleus carries a positive electrical charge, while the electrons carry a negative electrical charge. These forces within the atom work toward a strong, stable balance by getting rid of excess atomic energy (radioactivity). In that process, unstable nuclei may emit a quantity of energy, and this spontaneous emission is what we call radiation. There are many familiar forms of radiation. For example, we use light, heat, and microwaves every day. Doctors use X-Rays to see inside our bodies. Radio and television waves bring us our favorite shows. All of these are forms of radiation. Radiation is also naturally present in our environment, as it has been since before the birth of this planet. The sun and stars send a constant stream of cosmic radiation to Earth. Also, the Earth itself is a source of terrestrial radiation. Radioactive materials (including uranium, thorium, and radium) exist naturally in soil and rock. Essentially all air contains radon, water contains small amounts of dissolved uranium and thorium, and all organic matter (both plant and animal) contains radioactive carbon and potassium. In addition, all people have internal radiation, mainly from radioactive potassium-40 and carbon-14 inside their bodies from birth and, therefore, are sources of exposure to others. Finally, to a lesser degree, people are also exposed to radiation from the nuclear fuel cycle, from uranium mining and milling to disposal of used (spent) fuel. In addition, the public receives some minimal exposure from the transportation of radioactive materials and fallout from nuclear weapons testing and reactor accidents (such as Chernobyl). Where can you be exposed to radiation? In many occupations, radiation can be encountered as a natural part of their jobs. Some of these occupations include doctors, nurses, radiographers, X-Ray technicians, astronauts, dental hygienists, researchers, pharmacists, welders and airline and jet crews. The doses received can be up to several rem of exposure over the course of a year. Ionizing radiation cannot be seen, heard, tasted, smelt or felt in any way. Therefore it is important that those working in an environment where the equipment being used emits ionized radiation be monitored on a regular basis. Essentially, ionized radiation disrupts some of the atoms in its path causing them to separate into electrically charged (+ and -) components called ions. The atoms in our bodies become biologically useless if divided into ions. According to FDA CDRH 2001, of the trillions of atoms that exist in our bodies, small ionization may potentially cause no real harm; however, large doses of ionizing radiation can potentially cause sickness, cancer and birth defects. The radiation from X-rays, depending on the dose, can reduce cell division, damage genetic material and harm unborn children. Cells that divide quickly are very sensitive to X-Ray exposure. How can you minimize the risk of radiation according to the US NRC? For most practical purposes it is sufficient to detect the presence of radiation by the use of small devices called dosimeters. A dosimeter measures the exposure of radiation the user wearing the dosimeter is exposed to. For employees who work in a radiation environment, be it a nuclear power plant, a hospital or a dentist’s office, the wearing of dosimetry measurement devices on a daily basis is a sound radiation safety practice, and in many cases, it may be mandatory. It is important to know whether you have been exposed. The timely return of your dosimeter will allow you to know if exposure levels are within safety limits or if necessary action needs to be taken. The only way to know your real exposure level is to wear a dosimeter every day and to check your exposure reports regularly. If you have employees who are pregnant and working where exposure is possible, you should consider any necessary work restrictions and request a fetal badge in addition to the normal body badge. Even those who are of childbearing age should be aware of the dangers of radiation exposure and its potential affects on the unborn child. A fetal badge should be worn over the fetal area, along with the normal monitoring device. It is recommended that a fetal badge be worn under the lead apron when one is used. The most common kinds of ionizing radiation are X-rays, gamma rays, alpha, beta particles and neutrons. X-rays are the most common sources of radiation exposure for the general public, since they are commonly used in medicine. Moving at the speed of light, x-rays are a penetrating form of radiation, which means they travel through material easily. Exposure to x-rays is measured in units of radiation absorbed dose (rad) – the amount of radiation absorbed per unit mass of material. Rads are often converted to units of rem by multiplication with quality factors to account for biological damage produced by different forms of radiation. How far does radiation travel? Travel distance depends on the type of radiation, as does the ability to penetrate other materials. Alpha and beta particles do not travel far at all, and they are easily blocked. By contrast, gamma rays, x-rays, and neutrons travel a significant distance and are much more difficult to block (particularly for large radioactive sources). How can exposure to radiation be minimized? Time, distance, and shielding measures minimize your exposure to radiation in much the same way as they would to protect you against overexposure to the sun (as illustrated in the following figure). Healthcare personnel performing fluoroscopic procedures must ensure that the patient is kept as close as possible to the image intensifier side of the fluoroscopic unit and away from the tube side of the unit. All healthcare personnel involved in the fluoroscopic procedure must stand on the image intensifier side of the fluoroscopic unit, whenever possible, to reduce the radiation exposure. Standing on the same side as the image intensifier radiation intensity is decreased. Dosimeters are devices that store information about exposure to radiation. The crystals in Thermoluminescent dosimeters or TLD’s undergo a structural change that remains essentially stable until the crystal is heated. When heated, the stored energy is released as light, which can be measured and related to the level of radiation exposure. PL Medical’s dosimeters are one of the most advanced applications of Thermoluminescent detectors. The reason for this is that, according to the new 10 CFR Part 20 Guidelines of the US NRC, modern TLD dosimeters measure the skin dose, eye dose and deep dose specified in this regulation, in addition to the dose due to other nuclear particles. Thus, modern TLD dosimeters consist of at least four separate TL detectors, which are shielded by materials of various compositions and thicknesses, to allow for discrimination of photon energies and the nature of the incident radiation. The badges are small, lightweight and clip easily to clothing. Each badge is punch coded can bar coded with an ID number for identification and tracking. How can a dosimeter assist me regarding limiting liability in the workplace? Responsibility for damage caused by exposure to radiation in the work place is most often assigned to the employer. Employers utilizing sources of radiation in their business are required by the NRC to have a license permitting safe use of their source. Exposure to hazardous radiation is governed by laws that are designed to protect employees through safe handling and use of radioactive sources. Radiation damage experienced by employees is often an indication of failing to abide by these laws which leaves the employer exposed to legal liability for the damage caused. Developing and implementing a radiation safety program which includes documented occupational dose monitoring will assist employers in limiting their exposure to liability in the workplace. Who should be monitored for radiation exposure? Background radiation is naturally and inevitably present in our environment. A lot of our natural exposure is due to radon, a gas which seeps from the earth’s crust and is present in the air we breathe, the food we eat and the solar system on the whole. The average person in the United States receives about 360 mrem whole body equivalent dose every year. This is mostly from natural sources of radiation, such as radon. According to the US Nuclear Regulatory Commission, radiation monitoring should be considered for those who work in occupations where risks may be prevalent due to exposures from x-ray equipment. Even in environments where exposure risks may be minimal, such as in a dental practice, it is good policy to take the proper precautions in order to monitor exposure over time, ensuring healthy productive lives with no long-term effects. The best source of information about who should be wearing radiation badges/dosimeters, what type, and how often you should exchange your dosimeters is your state radiation safety office as requirements vary from state to state. To find specific state information about radiation regulation status, legislation, contact information, State Agreement, and program reviews, go to the U.S. Nuclear Regulatory Commission website. In addition, most state radiation control agencies have web sites. What is the National Voluntary Laboratory Accreditation Program (NVLAP)? NVLAP accreditation is available to commercial laboratories; manufacturers’ in-house laboratories; university laboratories; and federal, state, and local government laboratories. Laboratories located outside the United States may also be accredited if they meet the same requirements as domestic laboratories and pay any additional fees required for travel expenses. PL Medical is accredited by NVLAP (NVLAP Lab Code 200666-0). What is included in my dosimetry service? Our dosimetry services are provided on a subscription basis. Active and current subscribers will receive a shipment of personalized dosimeters each wear period. PL Medical will not charge you hidden fees or extra surcharges. When you receive a price from PL Medical, that is what you will see on your bill. Other provider’s in the marketplace often add in additional charges for these requests making your total cost of service much higher than advertised. What is an Occupational Radiation Exposure (Dose) Report? Once your dosimeters have been returned to our laboratory, a Dose Report will be issued. A printed report will be sent to your clinic for your records. The report shows the type and amount of exposure to each employee. The report includes the monitoring period, the dose equivalent for the current monitoring period, year-to-date and lifetime dose for each returned badge. It also mentions the annual exposure limits. If any reading should ever exceed the safety standards, the clinic will be contacted by phone by an authorized representative. Any further copies of the dose record can be obtained by contacting the laboratory or online via our myTLDaccount system. – Dose Equivalent: product of the absorbed dose in tissue, quality factor, and all other necessary modifying factors at the location of interest. – Deep Dose Equivalent (DDE): incremental measurement in rem for dose equivalent at a tissue depth of 1 cm. Applies to whole body exposure. – Shallow Dose Equivalent (SDE): incremental measurement in rem for dose equivalent at a tissue depth of 0.007 cm. Applies to external exposure of the skin or an extremity. – Eye Dose Equivalent (EDE) – incremental measurement in rem for dose equivalent at a tissue depth of 0.3 cm. Applies to external exposure of the lens of the eye. What are the occupational dose limits for personnel monitoring? Information regarding the occupational dose limits for personnel monitoring can be found on the occupational dose limits for personnel monitoring document located on our downloads page. What is the average annual dose exposure to the public? NCRP Report 93, 1987 indicates that the average annual exposure to individuals is 360 mrem from natural and manmade source, including routine medical procedures. And individual will receive approximately 5 mrem or radiation exposure on a coast-to-coast airline flight, 8 to 20 mrem from a chest x-ray, 10 mrem from a dental x-ray or 22 mrem from a cervical spine x-ray. What exchange frequencies are offered by PL Medical for your dosimetry service? PL Medical offers monthly, bi-monthly, quarterly and semi-annual exchange services. Is there any information I need to know regarding wearing my dosimeter? In order to obtain accurate and meaningful data from our dosimetry service it is important to observe the information contained in the wear instructions document located on our downloads page. Where should I place an area monitor? If you are monitoring occupational dose to employees in a room where the source is located, or a room near a source that radiation could potentially reach, an area monitor should be placed at the highest exposure level where an employee may be working. Never place an area monitor on top of a source, or in a high radiation area that would not reflect occupational exposure. It is the responsibility of the company to prove that the public is not being exposed to more than 100 mrem/year from outside a room/building. If you are monitoring potential exposure to the public, the area monitor should be placed on the outside of the room at the highest exposure level where employees/people are walking, sitting or may have access. Can I share my badge with someone else? Our badges are meant for use by one individual at a time so that the dose associated with that badge is assigned to that one individual’s records. If multiple individuals use one badge, it is not possible to separate out what dose belongs to each individual therefore making the reading invalid for the intended user of the badge. What should I do if my badge gets lost/damaged? If you loose your badge or it becomes damaged please contact PL Medical immediately so we can arrange to send you a replacement badge. What is a control badge and why is it included in my badge shipment? A control badge is provided free of charge for each cycle and plays a very important part in the monitoring system. It is used to determine background exposure readings during transit and while the badge is stored in the clinic. DO NOT WEAR THIS CONTROL DOSIMETER. This control dosimeter should be stored away from the radiation sources and/or outside of the X-Ray rooms. It should be placed in an area free from radiation, high temperature and humidity. Do not keep it inside a drawer or any other container. Break rooms or reception areas are good examples of areas that are typically appropriate. Never issue a control dosimeter to an individual or use one as an area monitor. It is of utmost importance that the correct control be returned with the appropriate shipment. What happens if I return my badges without the control dosimeter? The reported dose will include background and transit dose along with the occupational dose received by the individuals. For this reason it is important to return the control badge with your shipment to accurately report occupational dose. What happens if you detect a high dose on my dosimeter? Any report containing results that are outside of acceptable limits will be reviewed by the PL Medical staff and the customer will be notified immediately so that appropriate actions can be taken. I added a badge and received another control. What do I do with the control? A control dosimeter is always shipped with a badge shipment whether it is your routine shipment or a separate shipment for a newly added dosimeter to the account. The control dosimeter assigned to a shipment should accompany that shipment in transit both from and to PL Medical. Store control dosimeters away from radiation with dosimeters of the same type and wear date when not in use (do not store dosimeters near a radioactive source or in a X-Ray room). When returning dosimeters that shipped separately from the regular shipment for the wear date, include the control dosimeters that accompanied those shipments. While our badges do read below 10 mrem we do not report dose below 10 mrem due to the potential of false results at these very low levels of exposure. The 10 mrem threshold is the level required to be reported by the regulations governing this industry. By default, a dose is reported as MR on our dosage report if it falls below 10 mrem. If you wish to values below 10 mrem listed on your report please call us and we can update your report preferences to display this information. We use a digital X-Ray machine – do we still need dosimetry badges? Yes. While digital X-Ray machines do not require film, they still produce the same risk of exposure as any other X-Ray machine. I have another service. How do I transition to your service? After you receive our TLD badges, simply return the old ones to your prior service provider. Then once they send you a final dosage report, make a copy of that and send it to us so that we can include the data in our records of total lifetime exposure for each badge wearer. Why should I continue with my badge service after I have completed the state’s monitoring period? If there is a malfunction in your equipment and you have discontinued monitoring for radiation exposure, you may never know that your health and/or the health of your employees were compromised. Continuous monitoring for radiation exposure not only allows you to protect the health of you and your employees, but it also helps you to protect your business from liability should a lawsuit be filed by an employee who claims they received excessive radiation while under your employment. When can I expect to receive my dosimeters? Dosimeters are shipped via the United States Postal Service or FedEx. Systems are in place to ensure that your badge shipment arrives prior to your wear start date. Special services are available if you need expedited service to obtain your badges. Please contact a PL Medical service representative at (800) 874-0120 and we will be happy to discuss your unique needs. When do I return my dosimeters and how? You should return your dosimeters after your scheduled wear period ends. Your wear period is listed on your assignment sheet as well as indicated on the label of each dosimeter. We automatically send a replacement shipment about 10 working days before your next scheduled wear period. If you don’t receive your replacement shipment by your new start date, please keep using your dosimeters and contact us immediately. We provide a return mailing envelope that you can use to return your shipment with each shipment. Please place all dosimeters that need to be returned to us in this envelope along with the proper postage. Why did we get a report indicating that no control was returned? In general, the control dosimeter that was returned may not have been the same wear date. Also, if an additional dosimeter was added during the wear period, the control dosimeter shipped with the non-routine shipment may not have been included in the return shipment. After I delete a badge, should I send the badge back right away for analysis? No, you can wait until you return all of your badges/dosimeters at the end of the wear period. What do I include with the badges I return for processing? Routine returning shipments do not require any documentation. The information supplied on each badge is sufficient to process and report badge exposure. Return all dosimeters from your previous wear period(s) along with the control dosimeter(s) of the same wear date. When returning dosimeters that shipped separately from the regular shipment for the wear date, please include any control dosimeters that accompanied those shipments. Do not return any dosimeter that is suspected to be radioactively or otherwise contaminated. Your Radiation Safety Officer should supply PL Medical with an estimated dose for the individual whose dosimeter was contaminated. Why are there so many different terms when it comes to radiation? Rem, rad, curie, gray . . . what are they all for? One reason for so many different terms is that the United States uses traditional radiation units while the rest of the world uses an international system of units (very similar to the United States using inches and other countries using centimeters). In the international system, we use sievert, gray, becquerel, and coulombs/kilogram, for example, while in traditional units we use rem (= 0.01 sievert), rad (= 0.01 gray), curie (= 3.7 x 10 10 becquerel), and roentgen (= 2.5 x 10 -4 coulombs/kilogram). PL Medical reports all doses in rem on our reports. PL Medical has established a contract with Premier healthcare alliance, a leader in measurably improving patient care, to deliver dosimetry services for Premier members. Our Premier contract number is PP-IM-360. Should an employee that works at two facilities have two separate badges? Yes, the employee should have a separate badge at each location. This will identify which facility the employee was working if dose is received. I am (A person on my staff is) pregnant. What precautions should be taken? In the event that a female technologist declares that she is pregnant, you must follow necessary precautions to ensure the continuous safety of both her and the developing fetus. • The dose to the waist of an occupationally exposed declared pregnant woman must not exceed 500 mrem over the nine months of gestation. • When the declared pregnant woman wears a leaded apron, she must be provided with a fetal dose badge to be worn at the waist under the apron. • The allowable occupational dose (normally measured at the collar outside the apron) of declared pregnant woman remains 5 rem per year. • The declaration of pregnancy must be voluntary and in writing. • If staffing permits, responsibilities and tasks of pregnant technologists may be modified to reduce exposure. Do we need to provide the social security number and birth date? Check with your state radiation safety office, as they may require this information on your reports. For privacy reasons PL Medical does not print your full social security number on reports. ALARA is an acronym for “as low as is reasonably achievable.” Used and defined by the NRC (Nuclear Regulatory Commission) and many other licensing agencies, an ALARA program’s objective is to reduce occupational exposures and doses to members of the public as far below the specified limits as is reasonably achievable by means of good radiation safety planning and practice. What are the ALARA Investigational Levels? ANSI/HPS N13.11 is the National Voluntary Laboratory Accreditation Program’s (NVLAP) proficiency testing standard for personnel dosimetry performance. The first version of the standard was written in 1983 through a joint-agency agreement between the U.S. Nuclear Regulatory Commission (NRC) and the National Institute of Standards and Technology (NIST), an agency of the U.S. Department of Commerce. The 1983 version established the accreditation criteria and processes to facilitate the NRC’s requirement that all dosimeters used by licensees must be processed and evaluated by an accredited laboratory (later codified in the U.S. Code of Federal Regulations as 10 CFR 20.1501). The standard served as the foundation for NVLAP’s Ionizing Radiation Dosimetry proficiency-testing program. ANSI/HPS N13.11 recently underwent some significant changes. The 2001 and 2009 revised standards are a result of the continuing effort by the Health Physics Society (HPS) and the American National Standard Institute (ANSI) to construct a standard that is acceptable to the National Voluntary Laboratory Accreditation Program (NVLAP). How do I register for myTLDaccount? An e-mail will be sent to you with a temporary password that you will need to change upon your first login. Please make sure that “orders@plmedical.com” is listed in your safe senders list to ensure you receive your temporary password. What is the different between “Employee Login” and “Primary User Login” on the myTLDaccount site? Employee login has the ability to view only specific information related to a specific employee badge. The employee login functionality disables the ability to make changes to the account. Primary User login has the ability to view all badges at a facility as well as make changes to the account. Can I add multiple dosimetry accounts that I manage to my login? Can I scan badges into myTLDaccount for tracking? Once you receive badges from PL Medical you can scan badges for easy viewing regarding which badges have been distributed to employees and which badges have been returned at the end of the wear period. To use this function please selection the “View Your Badges” link and then press the “Scan Badges” button. Please note that based on the login type some of the above functionality may not be available. Can I disable receiving notifications from myTLDaccount? In order to disable receiving notifications from myTLDaccount please unselect the “Receive Notifications” checkbox located on main myTLDaccount page. All notifications will be disabled, including notifications regarding shipment activity and additional dosage reports posted. How much does myTLDaccount cost? myTLDaccount is a free service provided by PL Medical. If you are an existing dosimetry service customer you can self-register on the site. If you are a former customer needing access to myTLDaccount please contact us and we can activate an account for you over the phone. Do you offer specific lines for use in an MRI setting? Most large volume infusion devices, have metallic components that are not compatible with the MRI technology. Bringing an instrument into the MRI field could both harm the instrument and affect the quality of the medical image. When infusions need to be maintained, customers will add long extension sets and leave the instrument outside of the room. PL Medical offers a coiled 360″ MRI tubing set specific for this application. Details regarding this product can be found on our extension set product information page. Does PL Medical offer DEHP-free disposable I.V. sets? Yes. PL Medical offers an extensive line of DEHP-free products and can offer special sets to meet individual needs. Does PL Medical custom design I.V. sets? PL Medical will work with your organization to design and manufacture a custom I.V. set that meets your needs (minimum quantity needs to be met for any custom orders). Please call (800) 874-0120 to discuss your custom I.V. set needs. How are PL Medical surgical blades sterilized? Our surgical blades are sterilized with gamma radiation. What are VCI strips (what is the paper inside the foil packaging)? Vapor Corrosion Inhibitor (VCI) strips help to absorb moisture within the package, while ensuring product and packaging integrity by adding stability to the foil packs. What handle do I use with my surgical blade? Handle number 3 accommodates blade numbers 10, 11, 12, 12d, 14, 15, 15c and 15s. Handle number 4 is designed for use with blade numbers 20, 21, 22, 23, 24 and 25. Can I resterilize sterile surgical blades? Our sterile surgical blades are supplied as single use medical devices that are capable of withstanding the normal temperatures and pressures used in autoclave sterilisation cycles without damage to the product during one cycle. However, repeated autoclaving leads to a breakdown of the seal, compromising the sterility of the product. We recommend that surgical blades are discarded after one autoclave cycle, regardless of whether or not they have been used. What is the difference between carbon steel blades and stainless steel surgical blades? Carbon steel blades hold their edges longer throughout the procedure, while stainless steel blades are sharper at the beginning of the procedure. Carbon steel blades are also less expensive than stainless steel blades. Blade use is dependent upon clinician preference. PL Medical recommends that clinicians use the blades they are accustomed to using. Do you have descriptions for the most common surgical blade sizes? #10 – with its curved cutting edge is one of the more traditional blade shapes and is used generally for making small incisions in skin and muscles . The No.10 is often utilized in more specialized surgeries such as harvesting the artery during a coronary artery bypass operation, opening the bronchus during thoracic surgery and for Inguinal hernia repair. #11 – is an elongated triangular blade sharpened along the hypotenuse edge and with a strong pointed tip making it ideal for stab incisions. Used in various procedures such as the creation of incisions for chest drains, opening coronary arteries, opening the aorta and removing calcifications in the aortic or mitral valves. #12 – is a small, pointed, crescent shaped blade sharpened along the inside edge of the curve. It is sometimes utilized as a suture cutter but also for arteriotomies ( surgical incision of an artery), parotid surgeries (facial salivary glands), mucosal cuts on a septoplasty (repair of nasal septum) and during cleft palate procedures, ureterolithotomies (calculus removal by incision of the ureter) and pyelolithotomies (surgical incision of the renal pelvis of a kidney for the removal of a kidney stone – also known as a pelviolithotomy ). #15 – has a small curved cutting edge and is the most popular blade shape ideal for making short and precise incisions. It is utilized in a variety of surgical procedures including the excision of a skin lesion or recurrent sebaceous cyst and for opening coronary arteries. #15C – a longer cutting edge than the traditional No.15 blade. Mostly used by dentists carrying out periodontal procedures. #20 – a larger version of the #10 blade with a curved cutting edge and an unsharpened back edge. Used for orthopedic and general surgical procedures. #21 – a larger version of the #10 blade with a curved cutting edge and an unsharpened back edge. Larger than the #20 but smaller than the #22. #22 – a larger version of the No.10 blade with a curved cutting edge and an unsharpened back edge. Used for skin incisions in both cardiac and thoracic surgery and to cut the bronchus in lung resection surgery. Larger than the #20 and #21. #23 – has a flat, unsharpened back edge and a curved cutting edge. Used mostly for making long incisions such as an upper midline incision of the abdomen during the repair of a perforated gastric ulcer. #24 – slightly larger than the #23 blade and is more semi circular in shape. Used for making long incisions in general surgery and also in autopsy procedures. #61 – chisel shaped blade used for nail treatments in podiatry and chiropody. #62 – chisel shaped blade used for nail treatments in podiatry and chiropody. #64 – used for plastic and reconstructive surgery, hip and knee arthroscopy, tenotomy and minimal invasive foot and ankle procedures. #67 – used for plastic and reconstructive surgery, ophthalmology, cardio-vascular surgery and dental periodontics procedures. What are the most popular surgical blade sizes? Why should I use a Safety Scalpel? 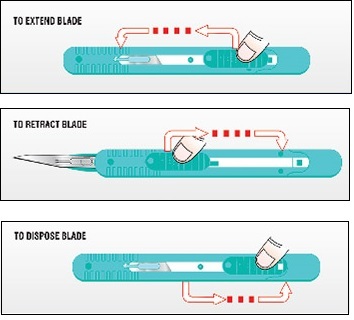 Safety scalpels contain or shield unused or contaminated blades during preparation, passing, disassembly and disposal. How do I use your retractable disposable safety scalpel? First, press down the lever and push forward to extend the blade out of the safety cartridge. The scalpel features a strong temporary forward lock position to prevent uncontrolled retraction when contacting with bone during use. After use, to retract the blade, press down the lever and pull backward. Finally, to dispose the device pull the lever completely back until you hear a ‘click.’ At that point the blade is fully retracted and is in the permanent lock position for final disposal. Where are disposable scalpels and safety scalpels most often used? Disposable scalpels and safety scalpels are typically used in the Emergency Department and Operating Room but are also utilized in other departments within a clinical facility. What sizes are available in your safety disposable scalpel? Our disposable safety scalpels are available in sizes 10, 11, and 15. What are the advantages of using PL Medical surgical blades? I am switching to your surgical blades – do you have a cross-reference chart? A cross-reference chart for our surgical blades can be found on our downloads webpage. What is the hardness of your surgical blades? Hardness is displayed as either Vickers Hardness Number (HV) or Rockwell C Scale Hardness (HRC). Our stainless steel surgical blades have a hardness or 700 HV, or 58.5 HRC. Our carbon steel blades have a hardness of 800 HV, or 62.5 HRC. The Vickers hardness test was developed in 1921 by Robert L. Smith and George E. Sandland at Vickers Ltd as an alternative to the Brinell method to measure the hardness of materials. The Vickers test is often easier to use than other hardness tests since the required calculations are independent of the size of the indenter, and the indenter can be used for all materials irrespective of hardness. The basic principle, as with all common measures of hardness, is to observe the questioned material’s ability to resist plastic deformation from a standard source. The Vickers test can be used for all metals and has one of the widest scales among hardness tests.